Cassius Clay wins gold at the 1960 Rome Olympics after defeating Zbigniew Pietrzykowski by decision in the finals of the light heavyweight championship. Muhammad Ali passed away on June 3, 2016, and the internet flooded with tears. A great man has passed, and all we can do is remember. In 1960, Ali was known as Cassius Marcellus Clay. The 18-year-old from Louisville was certainly one of the noisiest Americans at the Rome Olympic Games. He did claim to be the Greatest to anyone who would listen, but he was not viewed as a leader of the US team. 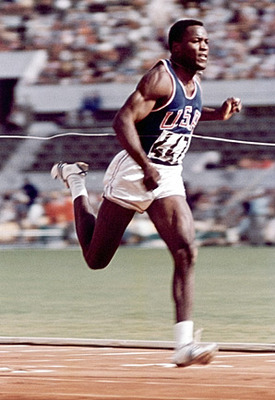 According to David Maraniss in his book, Rome 1960, Clay was simply not recognized on the same level as fellow US Olympians like decathlete Rafer Johnson, sprinter Wilma Rudolph, high jumper John Thomas, basketball players Oscar Robertson and Jerry West. Rafer Johnson in Rome in 1960. But one person in particular found Clay to be a kind of kindred spirit, or rather an alter ego. Maraniss wrote touchingly about the relationship between 1960’s Greatest Athlete in the World, decathlon champion Rafer Johnson, and boxing’s self-proclaimed Greatest of All Time. “He (Johnson) felt close to the young boxer from the first time they met at the Olympic Village in Rome. Months after they had won their gold medals, they toured the South together on a speaking tour of predominantly black colleges. They were roommates on the road and stayed up late at night as Clay told Johnson precisely how he planned to become an unforgettable character as well as the heavyweight champion of the world. Many of the cocky phrases and poems that Clay – and later Ali – brought to the world, he first tried out on Rafer Johnson in their hotel rooms. Johnson saved those discussions for posterity on a small tape recorder. 1960 Olympian and gold medalist Muhammad Ali defeats 1968 Olympian and gold medalist George Foreman in the Rumble in the Jungle in Zaire, in 1974. Clay won the gold medal in the light-heavyweight division at the Rome Olympics. He would go on to fame, recognition and notoriety four years later as Muhammad Ali. You can read all about that on the Internet, where Ali will indeed go down in history as the Greatest of All Time. 1960 Olympian and gold medalist Muhammad Ali defeats 1964 Olympian and gold medalist Joe Frazier in The Thrilla in Manila, in 1975. Posted in Boxing, Other Olympics, Pop Culture and tagged Cassius Clay, David Maraniss, GEorge Foreman, joe frazier, Muhammad Ali, Rafer Johnson, Rome 1960. Bookmark the permalink.